I watch the boy from where I am, way up above the trees. It is a summer night, so even though it’s not completely dark yet, the house is quiet. A long lane lays out a path, straight as the spine of a book, from a paved back road to the heart of the farm. It passes six fruit trees – the boy’s friend will fall from the highest branch of the pear tree the following autumn, scraping his back. The two will run inside, both crying, one from fear, the other from branches that tried to catch him but couldn’t. The boy’s friend’s mother will snap an aloe leaf in half, rub the sticky juice on his bleeding back. But on that night, while I watch from somewhere up in the clouds, everything is quiet. The farmhouse lights shine through the open windows. Flies buzz around the screens. The boy’s mother will pay him one penny for every fly he kills that summer. Some days he makes over $2.00. The smell of manure permeates the farm. But the boy’s days are happy, and when he is older the smell of manure will fill him not with disgust, but with a longing for the good old days. The boy is in his room, but his bed is empty. One of the doors in his room, always locked, leads to the other side of the farmhouse. Another door covers up a large closet. The boy is scared of both doors. He is under his bed, tucked in behind some boxes, rolled up in a blanket, holding a flashlight. In front of his tired eyes is a copy of Madeleine L’Engle’s “A Wrinkle in Time.” The boy loves two things: tight spaces and good books. He will finish the book that night. Another world. Another dream. He will spend the summer looking for tesseracts and angels in the shimmery shifts of light at the edge of his vision. He will stare up at the black sky and wonder what it would take to remove the dark shadows from his planet. What was your favorite childhood book? What is your most poignant memory of that book? Wow did this bring back memories for me. Thank you for that. Love L’engle. Love, love, love. I can’t wait to introduce Yosi to her books. I think the first books I fell in love with as a kid were the Sugarcreek Gang books. Not great literature, but definitely fun. your writing is beautiful – i hadnt read anything like that from you yet – i need to poke around your site more i suppose…which looks great btw. love wrinkle – and many others. was chosen to attend a 12 writer weekend with her right before she fell sick back in – oh shoot i dont know when it was. but i have always been sad i missed that. did hear her speak tho – when my kids were babies. does that mean i am old? That’s the best compliment I’ve gotten for a long time. Thank you so much Stacy. L’Engle is one of the first people I want to talk to when we reach that great library in the sky. And no, that doesn’t mean you’re old. I can tell by your writing that, no matter how many calendars you have discarded, you are still firmly rooted in all of the ages you have ever been (was it L’Engle or Angelou who talked about that? Can’t remember). 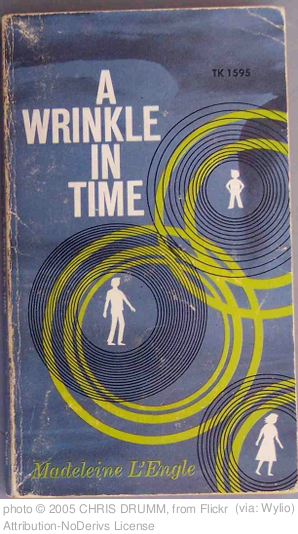 Makes me wish I’d read Wrinkle as a child–instead of a nearly unending stream of Stephen King. I have a memory like yours of staying up well past all common sense–to finish The Stand. Truly, truly a beautiful piece, Shawn.